Elevation is the height at a given location above a fixed reference point. Here the fixed reference is the North American Vertical Datum of 1988. 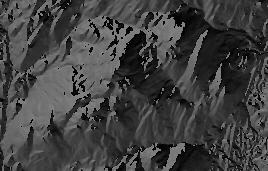 Elevation can be grayscale (left) where white areas have a higher elevation than dark ones. Elevation can also be shown with a color ramp. 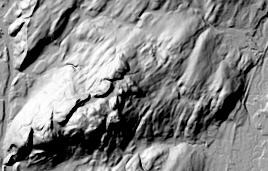 Hillshade is a grayscale view of terrain that considers the sun's relative position (azimuth & altitude). Here the sun is "shining" from the northwest (azimuth of 315°) and lights up the northwest facing slopes. The southeast slopes are in the shade and appear dark or black.  On a flat area (right), there is little variation in the grays. See Under the Hood for more about the hillshade function. 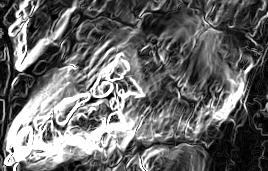 Shaded Relief is a colored view of terrain that considers the sun's relative position (azimuth & altitude). The highest elevations are white, then moving to red, orange, yellow, bright greens and finally dull greens and blues at the lower elevations. See Under the Hood for more about the shaded relief function. Aspect identifies the downslope direction of the maximum rate of change in value from each cell to its neighbors. In other words, the direction the slope faces (N, E, S, W or the degrees of a circle associated with each). See Under the Hood for more about the aspect function. Slope displays the rate of change of elevation. The higher the value (and closer to white), the steeper the slope. See Under the Hood for more about the slope function. Aerial Image (leaf off) is a spring time image taken from an airplane for reference. 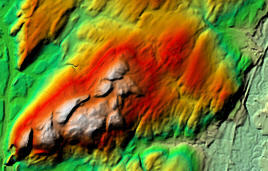 Notice that the terrain and slopes are difficult to see. On the left image, you can clearly see a major road, a river, and a number of large and small buildings. The northwest portion is not developed and this is what makes up Sleeping Giant state park. 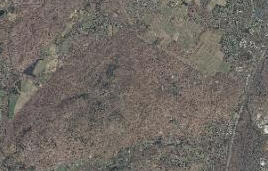 On the right image, you can see the meandering river surrounded by farm fields. Aerial (leaf on) is a summer time image taken from an airplane. 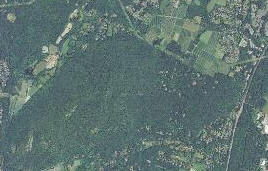 What is visible here is similar to the leaf off image (explained above), except here the forested areas can easily be separated from developed areas. On the right image, the fields with crops are far greener than bare fields.